The BA MkII Ford Falcon introduced in October 2004, was made to give a very minor refresh of the very successful 2002 BA series. The Fairlane/LTD variants were introduced in BA MkII guise in March 2005. The Falcon, along with the Fairlane/LTD was replaced in October 2005 by the BF. XT, E-Gas 4.0L, 6-cyl, Sedan/Wagon, 156kW, 372Nm. Futura, E-Gas 4.0L, 6-cyl, Sedan/Wagon, 156kW, 372Nm. Fairlane Ghia, 4.0L, 6-cyl, LWB, 182kW, 380Nm, A$56,000. Fairlane G220, 5.4L, V8, LWB, 220kW, 470Nm, A$62,670. LTD, 5.4L, V8, LWB, 220kW, 470Nm, A$72,790. Ford Performance Vehicles BA MkII Falcon range released October 2004. GT, 5.4L, V8, Sedan, 290kW @ 5500rpm, 520Nm @ 4500rpm. 0-100km/h- 5.86sec 0-400m- 13.61sec, A$59,850. GT-P, 5.4L, V8, Sedan, 290kW, 520Nm, A$69,850. Pursuit, 5.4L, V8, Utility, 290kW, 520Nm, A$54,850. The Ford factory team, in the 2005 V8 Supercars season, is Ford Performance Racing. They have two BA Falcons, #5 Greg Ritter/David Brabham, and #6 Jason Bright. 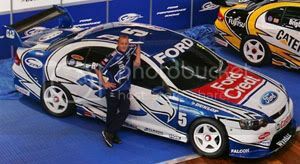 Ford acheived the feat of 1-2-3 in the 2005 V8 Supercar Championship, with the BA Ford Falcon. *prices at introduction. Images from Ford Australia, Ford Performance Vehicles, unless otherwise specified.